Because we have no minimum order amount, we can cater for the creative writer of family historian who wishes to see their work published. Covers can be made in a variety of attractive materials and imprinted with a number of type styles or your own die cast design. 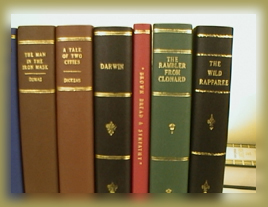 Short run editions from 250 to 2,000+ can be bound in hardback form or perfect bound. Saddle sewing as a stand-alone service can be provided to trade customers. For a book that has become ragged around the edges or one that is treasured, it is possible to repair or replace the binding and make a new cover. Where a paperback book is going to be subjected to a lot of wear or has already become worn, it is possible to lift the original cover, laminate in and use it as the 'book cloth' to rebind the book as a hardback. 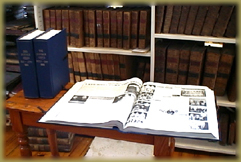 A centenary publication of the popular Longford newspaper that has been scenic bound for display and also to preserve in records. From tabloid to broadsheet, we bind outsize publications to preserve them attractively, for public viewing or archival use. 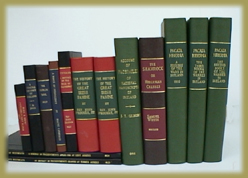 We also carry out conservation of Bibles, breviaries, parish records, births, marriages etc. 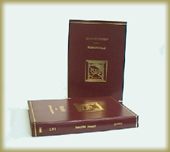 Copies can be bound according to the specifications of any college/university in Ireland or to any layout for personal copies. Standard turnaround time is 24hours, or a shorter period may be possible for emergencies. Such as ILRM, Irish Reports etc. can be bound to any specification, including in tan or dark green buckram with red, wine or black lettering pieces and gold/blind lines. Be it a large or small order.